An abandoned homestead near Villa Grove at the mouth of the San Luis Valley, Colorado. I have driven by this ruin at least 20 times and never noticed it before, I think the enormous mountain range in the background always catches my peripheral vision. 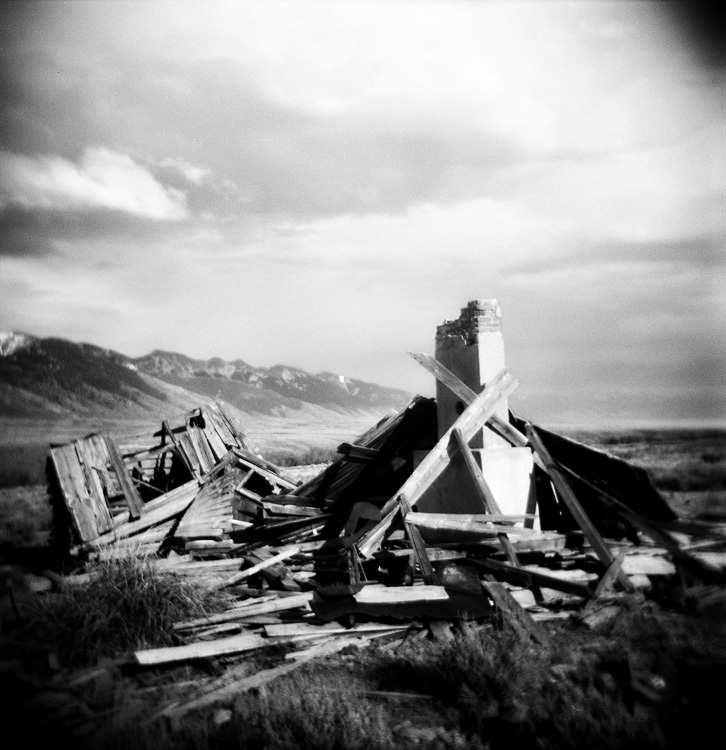 Holga with Ilford Delta 100. This holga shot really gives a great sense of sadness and weight to this image, while also giving it that vintage 1800s feel! I think this is where Led Zeppelin once had a party. Nice find! A place that was on the path of destruction? Hit by a tornado? Alexandra tells very well the feeling given by this picture. Looks like a disaster zone. Nice composition and wonderful processing. Nice BW, expressing the sad mood of photo. Wonder who once lived there. Gorgeous work. a sad and empty feeling here. This is very well done. I like the inclusion of so much sky. With the distant hills, the sky adds a great deal to the mood. I like the softening of the image and black-and-white presentation. Looks like they used to have an amazing view back when people lived here. Nice shot! Wonder who lived here once. And what made them desert the place to never come back. A really interesting and cool image! You have got some very evocative images here. I really like this one (and many more) – it’s a scene that is suspended in time. Great job! Also, thanks for stopping by my blog.